Thursday begins Yehia Khalil taking over Cairo Opera House’s Small Hall for a jazz night, while Sound of Egypt Orchestra takes to the Main Hall’s pit to play various famous soundtracks. Hanan Madi sings some of her classics at El SawyCulturewheel, Dina El Wedidi heads to 3elbt Alwan for a round of tunes, and Mazameer El Nile plays some folk at El Dammah Theater. When the night grows older, The Tap West hosts a disco and funk night, courtesy of Disco Masr and DJ Sewwes, Cairo Jazz Club’s classic rock night sees Raindogs, The Woodpeckers, and DJ Hashem taking to the stage, while it’s all about pop at The Tap East with Anis, and Bakir hitting the decks. Round two of Hey DJ takes place at Cairo Jazz Club 610, while Opia Cairo welcomes DJ Feedo to the decks to spin some hip-hop and R&B. Friday comes with two cover bands performing; Seattle covering Nirvana at ROOM Art Space, and MondeDalida covering Dalida at Darb 1718. Elsewhere, Mohammed Mounir, and Sharmoofers take to the stage at AUC’s campus for a round of tunes, Youssra El Hawary, and American band Sheroes take to the stage for jazz night at Tahrir Cultural Center, while Austrian duo Bartolomey Bittman play a spectrum of genres at MASQ. Meanwhile, at The Tap Maadi, Irtigalia Troupe take to the stage for an improvised performance, before Ramsi Lehner takes over, The Tap West’s hip-hop and R&Bnight sees DJ Feedo and DJ SoulM heading to the decks, The Tap East’s house and funk night sees Masters at Funk taking over. 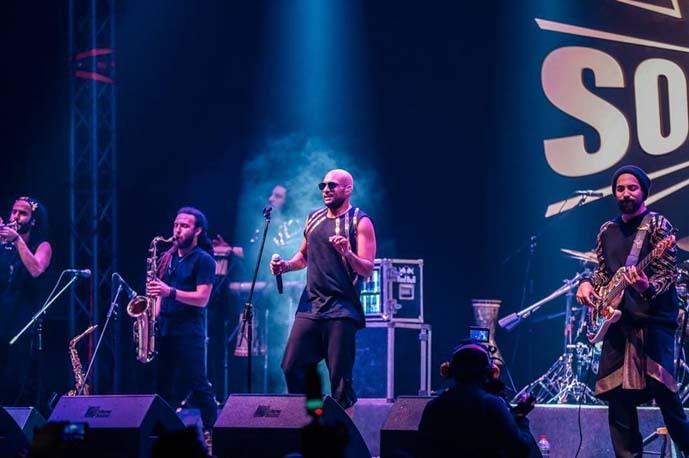 Elsewhere, Cairo Jazz Club hosts a house night, courtesy of DJsAshmawy, Omar Saad El Din, and Timour Omar, while Cairo Jazz Club 610 sees pop star Ehab Tawfik taking to the stage alongside RamyDjunkie on a night called Ma Yatloboh El Mostame3oon. As for Saturday, Medhat Saleh sings some of his all-time favourites at MUST Opera House, Ali El Haggar takes to the stage at El SawyCulturewheel, Dalia Farid sings various originals and covers at ROOM Art Space, while Janan play some pop/rock tunes on Wisdom Hall’s stage at El SawyCulturewheel. The countdown to the end of the weekend begins when DJ Kashouty spins some pop at The Tap East, Hassan Ramzy plays some acoustic tunes on his guitar at The Tap Maadi, and Nour Project take to the stage at Cairo Jazz Club for another night of Saturday L’Oriental.